Being strategically located a few blocks away from Downtown La Barra, which concentrates all youth activities in Punta del Este, Backpacker de La Barra Hostel & Inn allows you to combine the calm of a place plenty of green, surrounded by gardens and silence, with the proximity of the best discos and bars of Punta del Este, as well as a good circuit of quality restaurants for those who like the good food . The Hostel offers the comfort of spacious shared rooms and modern bathrooms with hot water 24 hs. The Inn offers you spacious rooms with private bathroom, air conditioning and minibar. For both, we have a swimming pool, public telephone to call and receive, wireless internet, bar, restaurant and much more for you to have exceptional vacations. 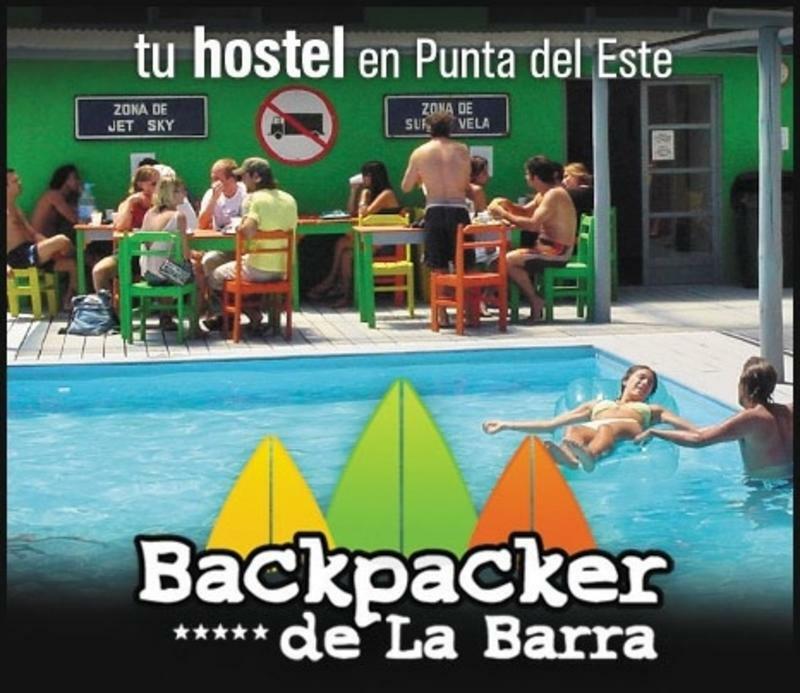 As we do not accept groups over 4 people , Backpacker de La Barra Hostel & Inn is ideal for couples who want a romantic stay, combining relax and entertainment in contact with nature. It is also ideal for small groups of friends who want to combine beach and night in a friendly atmosphere, quiet and respectful, with many common areas to meet other travelers and make new friends. In high season, between Christmas and January 31 you will have holidays, night life, many people, top beaches, a lot of partiesand a lot of heat. In mid season, or December, February and March up to Eastern you will find a more distended and relaxed ambience, more day activities, beach, sun, swimming pool, walks, with good climate, heat and enough night activity, without being the madness of January. Punta del Este is in general more 'familiar'. After the Eastern and up to ends of November it is the low season and the calmness is complete. Silence, nature, solitude special for artists, writers, scientists and other persons who need a serene and placid ambience to concentrate on his own activities. 5 Private VIP Deluxe with up to 4 beds, Private Bathroom, Air Conditioning, Minibar, and garden view. 1. We have our own Van to pick you up at the Bus Station or at the Airport. Ask us about our rates. Also to take you when you leave. It is handier and cheaper than a taxi. If you prefer more adventure, when you arrive to the Bus Terminal of Punta del Este, you take the 'micro' to La Barra, as soon as you cross the bridge, you get down at the stop n 40. You'll see a yellow backpacker sign at your left, across the street. You take this road (n9) about 500m. straight ahead always following the signs and you'll be here, you'll see the hostel at your left. You can coordinate with us and we will pick you up at the bus stop for free. Coming from the East, once you pass by La Barra's gas station (Ancap), go straight ahead by Camino Urquiza (that goes to San Carlos' Zoo) 500m. and turn left one block and then right and you'll find us at your left, there are signs along the road so you'll find us easily. You can coordinate with us and we will pick you up at the bus stop for free. You may check Google Maps or Google earth where you will find us, for more details please contact our Hostel.